We’d love your help. 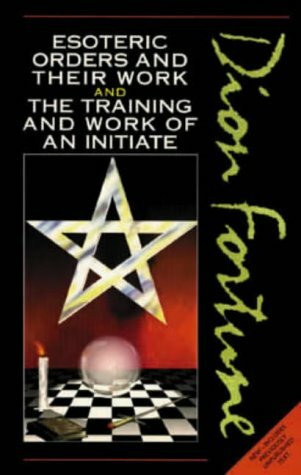 Let us know what’s wrong with this preview of Esoteric Orders and Their Work and The Training and Work of the Initiate by Dion Fortune. The first volume examines how occultists have rstricted admission to their secret societies. The mystery is uncovered and their operations are descrobrd in detail. The second volume describes the ancient heraldry magical system and clarifies typical misunderastandings. To ask other readers questions about Esoteric Orders and Their Work and The Training and Work of the Initiate, please sign up. My study into Esoteric Orders have revealed a few things. First, while Fortune is clearly the lesser of two evils when paired with Crowley, it is still an evil. This book alone is so peppered with casual racism that I even wonder is her work inspired some of the fascists of her day. Second, esoteric orders are designed to create a system of power and we all know the first order of anyone in power is to maintain that power. The term “Master” to apply to the Person guiding the initiate and the fre My study into Esoteric Orders have revealed a few things. First, while Fortune is clearly the lesser of two evils when paired with Crowley, it is still an evil. This book alone is so peppered with casual racism that I even wonder is her work inspired some of the fascists of her day. Second, esoteric orders are designed to create a system of power and we all know the first order of anyone in power is to maintain that power. The term “Master” to apply to the Person guiding the initiate and the frequent use of actual torture to perpetuate it (I.e. Gardnerian Wicca, for instance, an esoteric order possibly inspired by Gerald Gardner’s work in The Golden Dawn, requires initiates to strip naked and be whipped forty lashes by the “master,” who then gets whipped in return.” Given that esoteric knowledge is supposed to enlighten us to a greater version of ourselves, don’t you find it suspect that these esoteric orders begin with subjugation—the very act that creates the enslaved mind in the first place? In the same breath, Fortune tells us “Beware Of the self-taught occultist; he is as unreliable as the self-taught healer” (32), and then “... it is possible to obtain access to the source of the secret wisdom by purely intuitional and meditative method” (56), and in that cheap linguistic trick manages to saw the lady in half before our eyes and retain that He is the only one able to reassemble her. Or, put more concretely, Fortune says you can’t trust people who train themselves because they weren’t chosen by someone else (which is classist at best, perhaps ableist and racist as well), and also that some special people actual CAN self-teach if they are first blessed by intuition (implying selected by God/dead Herself), so riddle me this, Fortune: who is whom? Because it is mighty convenient that we are to trust no one but the perpetrators of our abuse (initiations and torture) and that those perpetuators are perhaps selected intuitively... I’m the master because I’m the master—my intuition told me so—and you’re not because you are my slave. In my world, knowledge is power and we all have a right to power over ourselves but not over others. And furthermore, education and spirituality are rights and therefore should be accessible and free of hierarchy. You have no power over me, and what scares you most is that you see clearly the power I have over myself. I hold my power. I know it well. Even the allure of esoteric knowledge cannot make it waver. I’m as terrifying as a gorgon, aren’t I? Abstract (read: evading) description on how esoteric orders in different manners work, also some useful definitions. Not completely enlightening for me. This provides a good overview of the esoteric world. Like all of these books the more you know the more they make sense but this does address a number if important issues for the Seeker. It gives you some hints on how to find a teacher, what to look for and what to avoid. A must read for all occultists. A must read for Occultists and critics of the Occult who ignorantly babble about our secretive tendencies as if it were some kind of a flaw. From 1919 she began writing a number of novels and short stories that explored various aspects of magic and mysticism, including The Demon Lover, The Winged Bull, The Goat-Foot God, and The Secrets of Dr. Tavern Violet Mary Firth Evans (better known as Dion Fortune), was a British occultist and author. Her pseudonym was inspired by her family motto "Deo, non fortuna" (Latin for "by God, not fate").